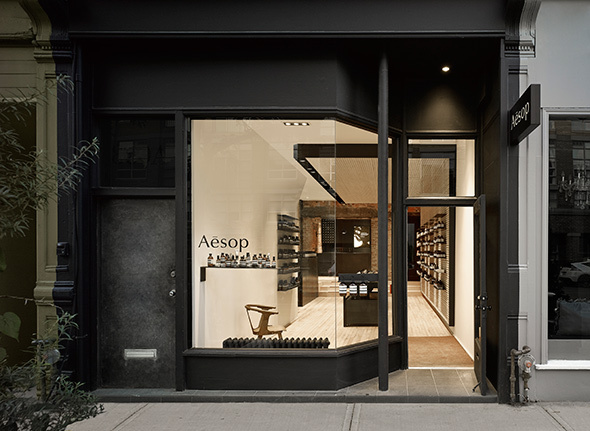 Aesop, an upscale Australian skin care brand, opened its own freestanding location in Toronto after years of success peddling their natural, unisex products at stockists like Jacob & Sebastian , Oliver Spencer and WANT Apothecary . The brand's aesthetic is immediately recognizable at the boutique; strikingly minimal but injected with personality - and if it still doesn't catch your eye, the entire place smells either warm and woody or smooth and spicy (I can't decide, I just know that it's good). I caught wind that each location looks as different as the city it's in - a quick scroll through their Instagram feed validates it. Designed by locally-based architecture firm superk端l , the West Queen West space is ultra modern with quirks like exposed brick and blackened steel; a wall covering made from rippled wool fabric crawls onto the ceiling and everything is lit up with sunshine (and pod lights). The label was founded in 1987, and to say they understand apothecary is an understatement. Their skin, hair, and body products are aromatic wonders in pharmaceutical-style brown bottles; the company's in-house laboratory is always working to develop new formulas, some even taking a decade to perfect. Of course, the prices reflect their hyper-meticulous demeanour, bringing most goods to the $40 - $85 range (and one presumably miraculous parsley seed eye cream to a whopping $397). As somebody who's perfectly content with run-of-the-mill bar soap and whatever moisturizer is within reach post makeup removal, I can admit it's a little overwhelming to walk in and find walls of identically-packaged shampoos, conditioners, facial cleaners, toners, serums... the list goes on and on. 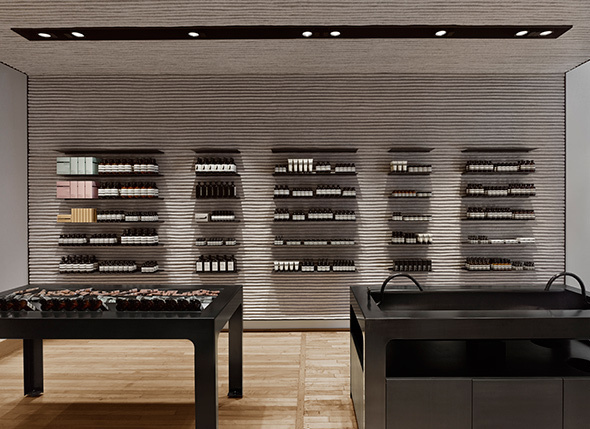 Aesop even makes post-poo drops in collaboration with A.P.C. ($39) to sprinkle into the toilet "after vigorous bathroom activity has occurred." Luckily, the shop offers consultations to help find the perfect solution (or combination of solutions) for you. The staff are extremely knowledgeable in body products (so much that my brain shut off and I had to tune out when they started talking about pH levels during my visit), so if you're ready to shell out in the name of hydrated skin, give 'em a visit. If not, the store's scent is pleasant enough to earn one anyway.